Two-plus kilometers per lap. 50+ minutes of racing. And yet sometimes, a cyclocross race can come down to a matter of inches. Sanne Cant (Beobank-Corendon) knows this better than anyone in the Women’s field. 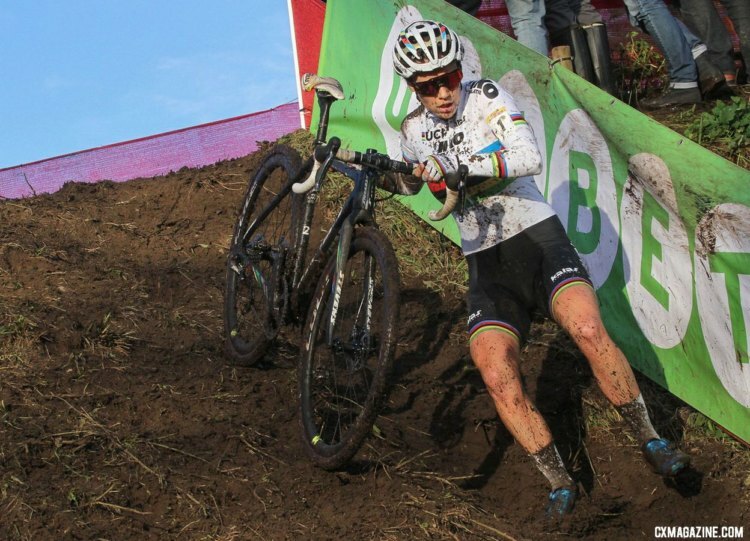 At the World Championships in Bieles, she hit the rut, Marianne Vos did not, and she is now wearing the rainbow stripes. 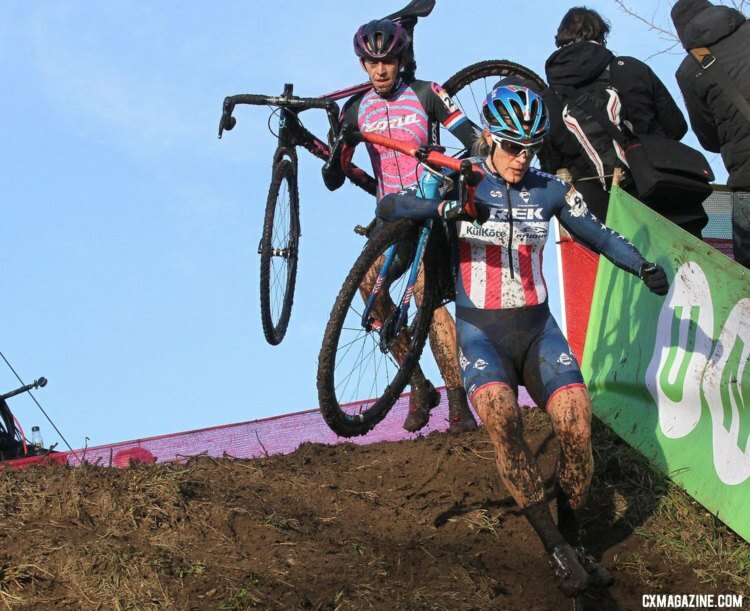 On Saturday at World Cup Zeven, Cant found herself off the front with Katie Compton (KFC Racing p/b Trek/Knight Composites) in a repeat of last year’s battle in Germany. Early in the penultimate lap, Cant rode a series of steep ups cleanly. On the last one, Compton hesitated and had to put her foot down. A few inches and she would have been up and over. Cant’s gap was only a few meters, but she knew what to do with it. 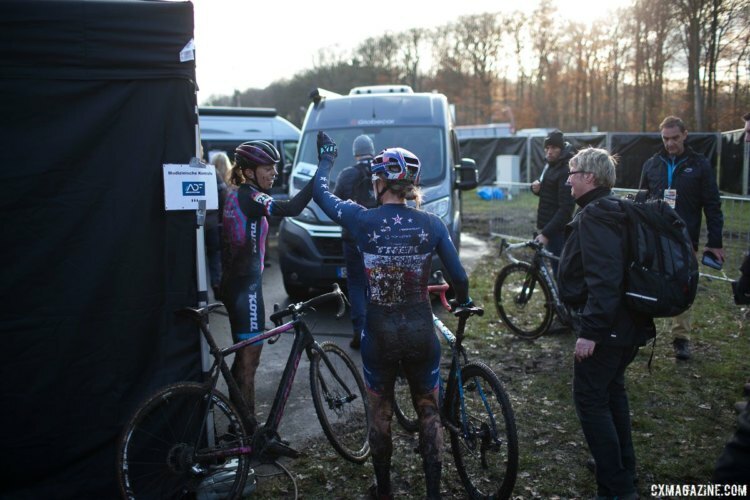 Her lead was eight seconds by the end of the lap, and from there, she was gone to her second straight World Cup win on a cold, muddy, epic afternoon in Zeven. After Friday’s course inspection, riders knew they were in for a mudder on the wet, cold afternoon on Saturday. Mud? Puddles? Running? There would be plenty. The holeshot led to a series of narrow, muddy straights, turns and off-cambers that got congested quickly. It was a bad day for a slow start. Eva Lechner (Clif Pro Team) grabbed the holeshot from her starting position on the right side of the grid. 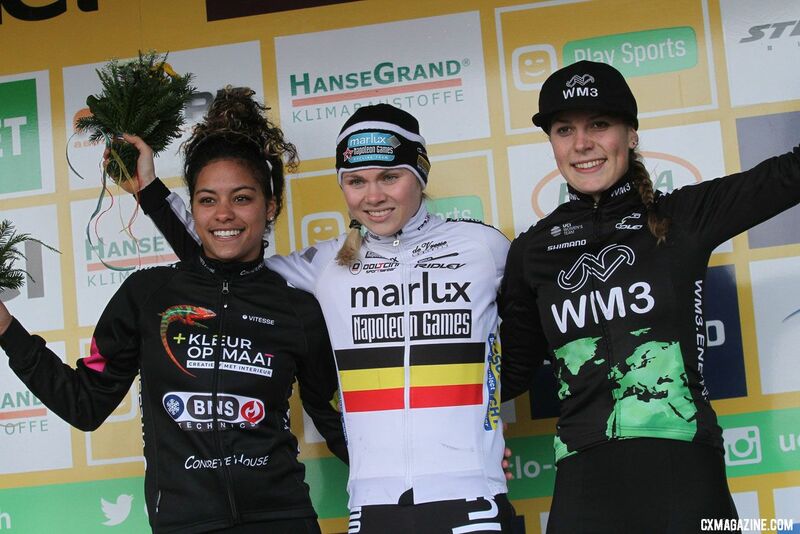 Cant and Compton joined her at the front, while Katerina Nash (Clif Pro Team) and especially Sophie de Boer (Parkhotel Valkenburg – Destil Cycling Team) learned the hard way about the importance of a fast start. Thirty seconds in and the two had their work cut out for them. Besides the stalwart Cant, the animators in the first lap were a group of riders from the U.S. and U.K. If you have been following Helen’s Wyman Wednesday columns, you know Helen Wyman (Kona Factory Racing) had a big smile on her face after seeing the course and conditions in Zeven and she rode like it early on. 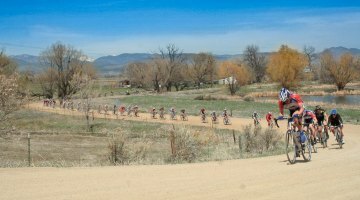 Wyman moved to the front halfway through the first lap and opened up a gap on Cant and the others by running the second-to-last descent while many of the others chose to ride. Also in the mix with Compton was Ellen Noble (Aspire Racing). Noble aced the start and put herself in a top five position in the chase group with Compton. 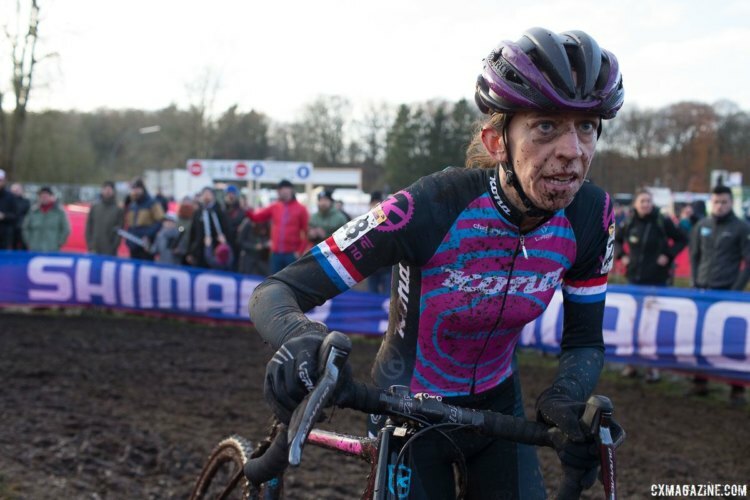 At the end of the first lap, Wyman had a small gap on Cant thanks to her timely run down the descent and Noble, Compton and Loes Sels (Crelan-Charles) formed the first chase. Early in the second lap, Cant bridged to Wyman and the two were off the front. 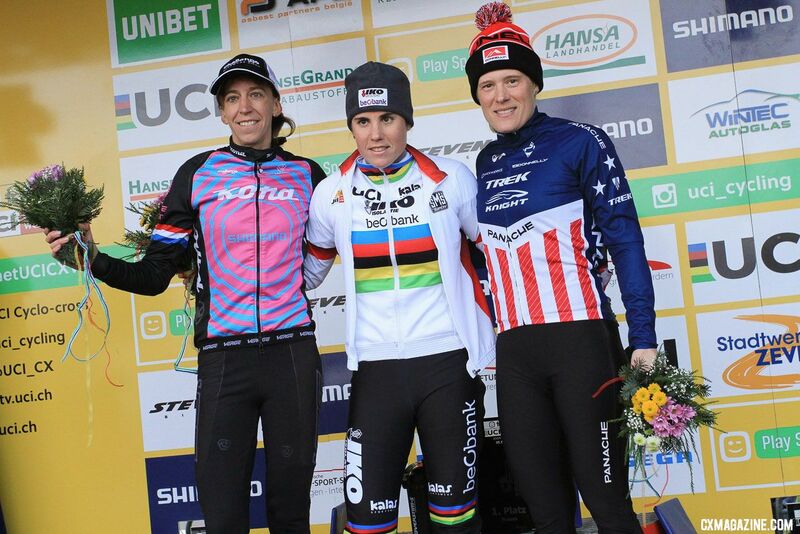 The situation was not all together unfamiliar after the duo briefly battled late in last Sunday’s World Cup in Bogense, Denmark after Cant’s last lap mechanical. The chase behind them was Compton, Sels, Noble and Nash. 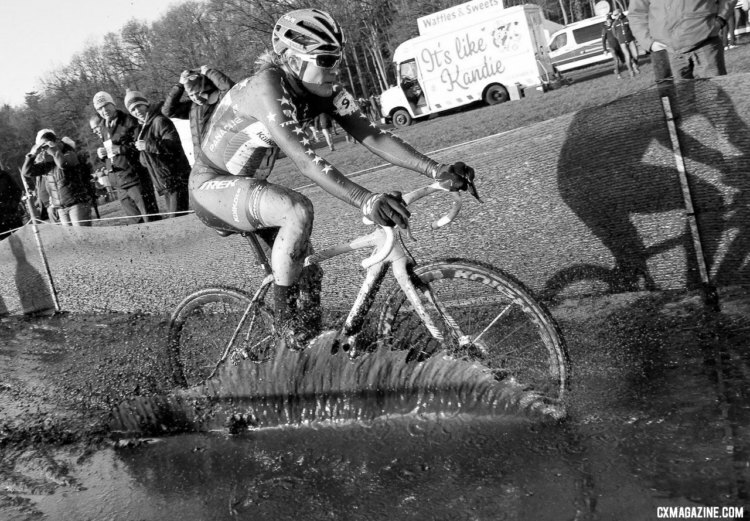 Nash had overcome her slow start, but with the thick conditions, it remained to be seen how much the early effort would cost her. Midway through lap two, Compton broke away from the chase to try to bring back Wyman and Cant. Behind her, disaster struck for two of the others in the chase. At the bottom of a descent that 180-ed into a steep climb, Sels had an issue with her drivetrain. Right behind her, Noble also suffered a mechanical. The two tried to get their rigs working again while rider after rider passed them by. With the chase unexpectedly sorted out, the riders at the front finally had some space to ride their races. 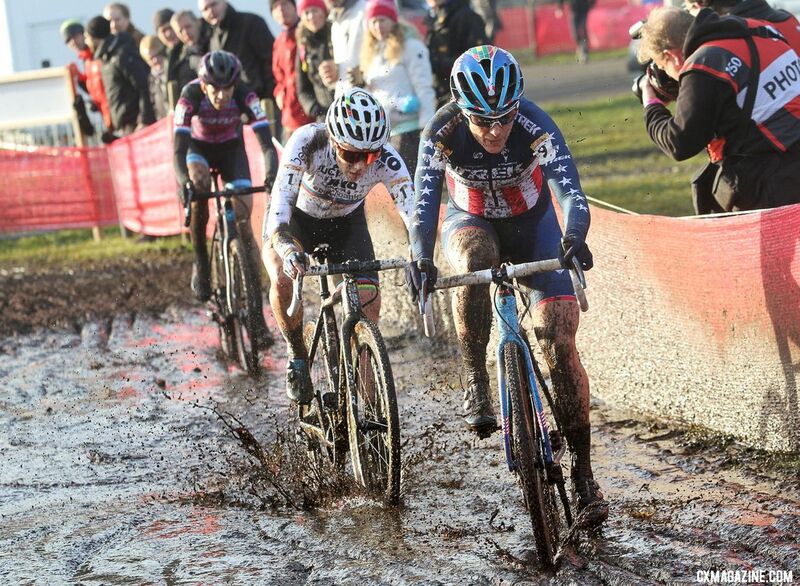 Compton used her power in the thick, muddy straights to slowly work her way back to Wyman and Cant, the latter of whom who opened up a gap at the start of lap three. Compton made the catch of Wyman in lap three, and then after Cant had to dismount before the second pit, she also caught the World Champion. With two to go it was shaping up to be a repeat of 2016, with Cant and Compton at the front deep into the race. However, this time, Wyman was also nearby, just three seconds back. If Cant wanted to win her third World Cup of the season, she certainly had her work cut out for her. 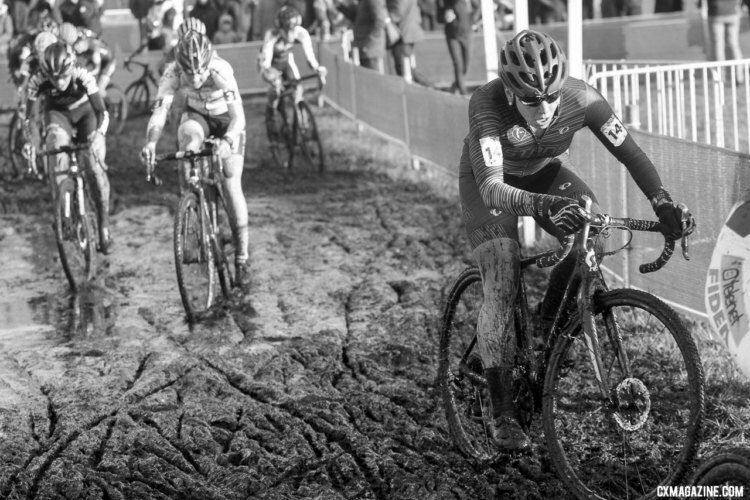 In the narrow, muddy section at the start of the lap, being first had its advantages. Coming off the pavement into the penultimate lap, Cant and Compton wasted little time trying to get to the front spot. 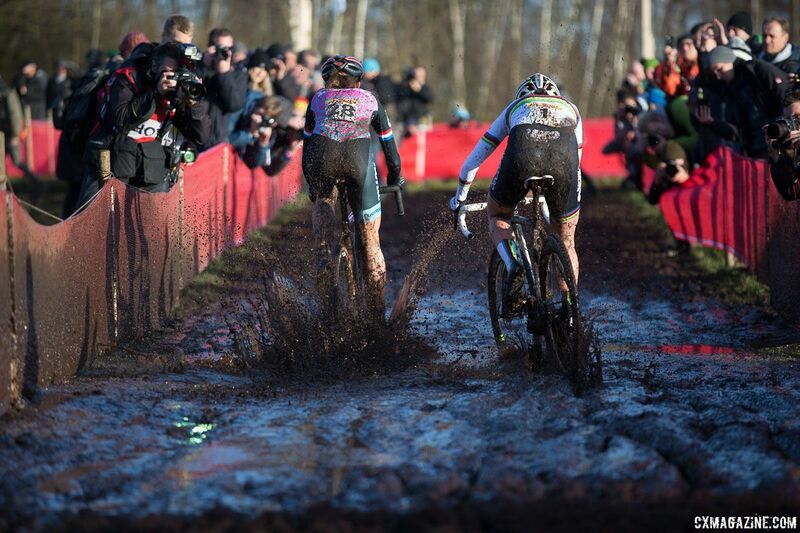 Cant took the lead, then Compton powered past her in the mud. Then Cant again grabbed the lead on the series of ups along a berm. The last of the steep ups was at a right-hand turn after riders dropped off the berm. 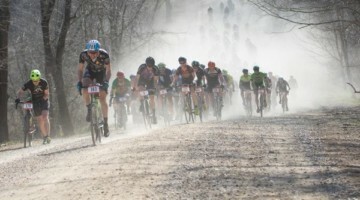 Cant consistently rode the feature throughout the race, while other riders were split between the ride and run. Sitting second wheel, Compton powered into the steep incline. She did not get up cleanly and hesitated at the top. Just a little more traction and she would have been up and over. Her hesitation gave the advantage to Cant. Had she been in first, the story of the race may have been different. Cant had a small gap and she exploited it immediately. A small two-second lead grew to eight seconds by the end of the lap. Inches turned into hard-fought meters that Cant would not willingly relinquish. During the last trip around the Zeven circuit, it was clear Cant had successfully metered her efforts. She rode the last lap with a vigor that made it clear there would be no catch for her two English-speaking counterparts. The win was Cant’s third World Cup victory of the season and fifth podium in five races. When the bright lights are on, even through the overcast skies of Zeven, she has brought her A game. 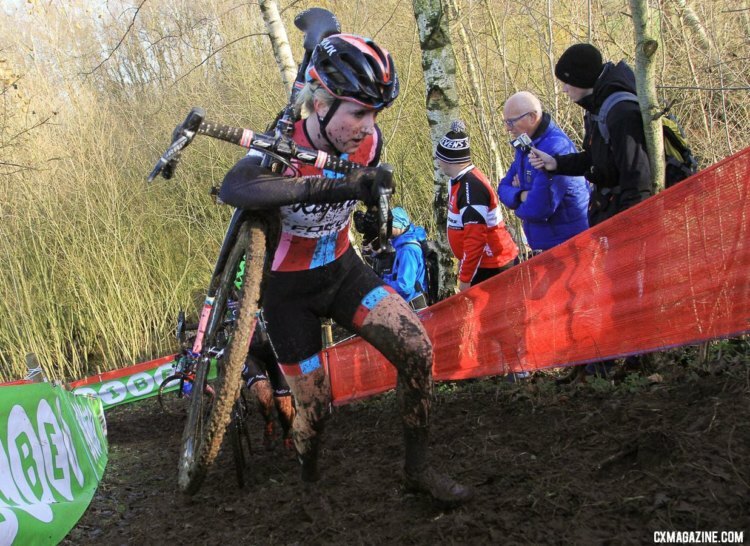 In the slog of the last lap, Wyman again showed why she loves the mud. She passed Compton midway through the last lap and opened a gap for a solo second. Compton held on for third ahead of Nash. Nash finished fourth, and after her messy, muddy start, De Boer fought back to make it all the way to fifth. Brammeier finished 8th after her fast start, Kaitie Keough (Cannondale p/b Cyclocrossworld.com) took 11th, Rebecca Fahringer (Stan’s NoTubes p/b Maxxis/gofahr) finished 12th after riding in the top 6 during the first 3 laps, Canadian National Champion Christel Ferrier-Bruneau (SAS Macogep Aquisio) took 15th, Noble recovered to finish 18th and Elle Anderson (cycling.be / Alpha Motorhomes) finished 22nd. Laura Verdonschot (Marlux-Napoleon Games) finished tenth overall and first for the U23 riders. Full results are below. 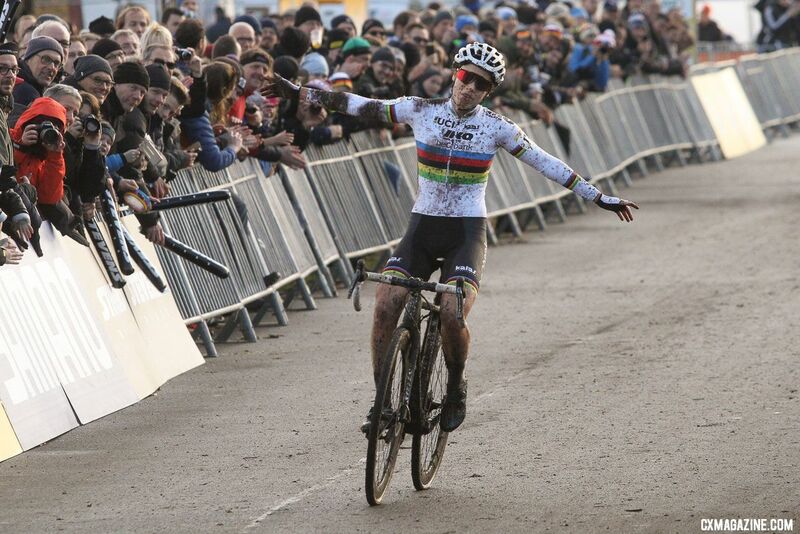 The Telenet UCI World Cup returns in December at Namur on December 17 and Heusden-Zolder on December 26. What’s wrong with Maud Kaptheijns as of late?